Maya teetered on the edge of the Sea Ranch tide pool, the toes of her green Converse gripping the seaweed-covered surface. I squatted near her, not certain enough of my balance to be so close to the edge. The tide was going out. We stared at the starfish in the pool, releasing tube foot by tube foot from the rock. The free arms dangled in the water. 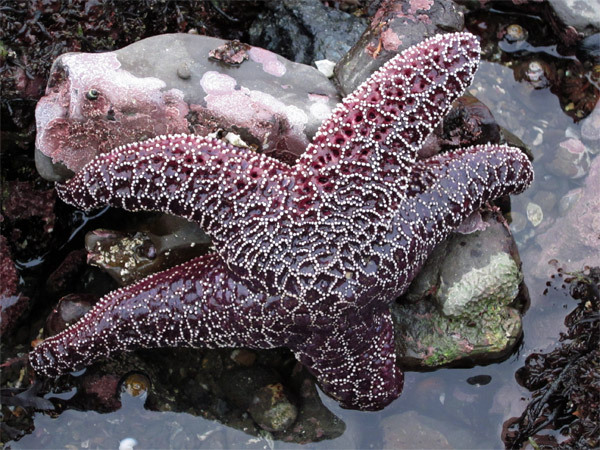 Eventually, the starfish would separate its last suckers from the rock and float wherever the tide would take it. Who knew where it would go next? Who knew if it would be smashed against the rocks on the tide’s way out? Or eaten? But it couldn’t stay, so it had to let go. And it would be pretty and pleasant to think that once the starfish had released all its feet, that it would be Free and Floating and At One With the Ocean. But the tide goes out. And comes back in. And the starfish will find itself on a different rock, on a different day, in a different tide. And have to let go all over again. I don’t know what it’s like to be a starfish, but I do know what it’s like to have my world tilt sideways. Disoriented. In free-fall. Sometimes you step on a sea urchin. Sometimes the water half-carries you where you’re supposed to go. Sometimes I can bring myself to trust the tides. Recently some of my dearest friends have experienced startling turns in their journeys. Unexpected. Unwelcome. They feel, perhaps, adrift. Unmoored. Can I sit with them, feel their chest-tightness and heaviness, without force or avoidance? Can we get used to the sea-change of relaxing into the unknown instead of fighting it? The sense of wading chest-deep in currents, trying to keep our footing on slippery rocks and seaweed, holding our arms out for balance as the waves buffet us? I usually hold on with all my strength to what seems immobile and sure. But immobility leaves me high and dry, while the changing tides sustain and nourish me. I am learning to trust myself, to trust others, to trust the Universe to make things right. To hold on when I need to, and to let go, over and over again. To surrender my need to be in control. light and strong as grace. Beautifully written, beautifully expressed Michelle… As per usual 🙂 . This is just beautiful! And all so very very true.